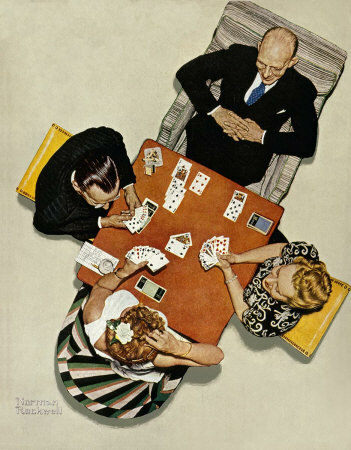 Bridge Game, a Norman Rockwell painting, appeared on the cover of The Saturday Evening Post published May 15, 1948. This is another timeless favorite of Rockwell collectors, a classic for the ages. An alternate title for this painting is The Bid. I would call it The Finesse. This painting was Rockwell's fourth cover for The Post in 1948. In 1948, there were seven Norman Rockwell Saturday Evening Post covers published. This was also Rockwell's 254th cover illustration out of 322 Rockwell painted for the Post. Rockwell's career with the Post spanned 47 years, from his first cover illustration, Boy With Baby Carriage in 1916 to his last, Portrait of John F. Kennedy, in 1963. The original oil on canvas painting is owned by a private collector. I have seen pristine original copies of this magazine cover sell for well over one hundred dollars on eBay. And to think it only cost fifteen cents originally! And it was mint condition then, too. This classic Norman Rockwell painting shows us a bird's eye view of a rousing game of bridge in progress. The players are all adults. Two couples are playing. All wear a pleasant look on their faces, so we can assume that this is a friendly game played in one of the couples' homes. Both of the men wear suits. One wears a pinstripe suit while the other a black suit with white shirt and blue tie. The ladies are even more decked out. The lady on the right is waaring a black and white blouse with an intricate pattern. Her skirt looks to be black. The lady closest to us is wearing a pure white sleeveless dress. She also sports a white flower in her hair. The lady in white is scratching her head in thought. She is pondering her choices and chances with her play from the Dummy hand of her partner. The table and the unmatched and comfortable chairs indicate to us that this is probably a game being played in a home. It may just be that these two couples are pleasantly whiling away a spring night enjoying each other's company. The game being played is even more interesting than the players. Five tricks have been played. The lady in white, the declarer, has taken two tricks; her opponents have taken three. We do not know what the first five tricks played were, but we can see how the rest of the game should play out. Both she and the man in the pinstripe suit, who sits to her left, have seven cards left in their hands. The dummy hand and the lady in black and white, who sits to her right, have eight cards left. So it is the dummy's turn. We can safely assume that the trump suit is spades. One can see all thirteen trump spades in the four different hands. Both declarer and dummy started with five spades each. It would be very bad bridge to be bidding any other suit as trumps. She knows that her opponents only have three spades between them. So chances are fair (33%) that one of them is holding a singleton King. The only piece of the puzzle missing for Declarer is "Who has the King of spades?" It is apparent that she led the Jack of spades. I believe that she was trying to finesse an extra trick with the Jack. If you know bridge or any card game, a finesse is where you lead a card that probably would have little chance of taking the trick. That is, a card that, while high enough to beat most cards, would probably be overplayed by your opponent. In a finesse play, you count on your opponent being afraid that your partner will overplay their card that overplayed you card. Whew! In this case, if the man in black on her left had the King of spades, everything would be peachy. The Ace of spades resides in the dummy's hand until it is needed. The only problem, as declarer will soon find out, is that the lady in black and white on her right holds a singleton King of spades. Bridge Game was only one of 322 Norman Rockwell Saturday Evening Post covers; Here is the list of Norman Rockwell Saturday Evening Post cover illustrations. The lady in white, the declarer, is scratching her head in thought. Should she play the Ace from the dummy's hand in hopes that her opponent on the right has the King? Or should she try to stretch out her trumps by holding the Ace? This could very be the pivotal trick for the whole hand and maybe even the rubber. I wish that the score was more legible, but maybe that is the mystery for us. Did she bid more than four spades? If so, this may well be where the rubber meets the road! The way I count it, even if she lets the King take this trick, she should still take the rest of the tricks. Let's just hope she didn't overbid. Overbidding will even kill a great hand like this. If only she had our view of the entire bridge game, she would know her best course. Norman Rockwell's extensive research and painstaking recreation of the scene perfectly captures the essence of this particular trick. Do You Have A Great Story, Opinion Or Contribution About Bridge Game?